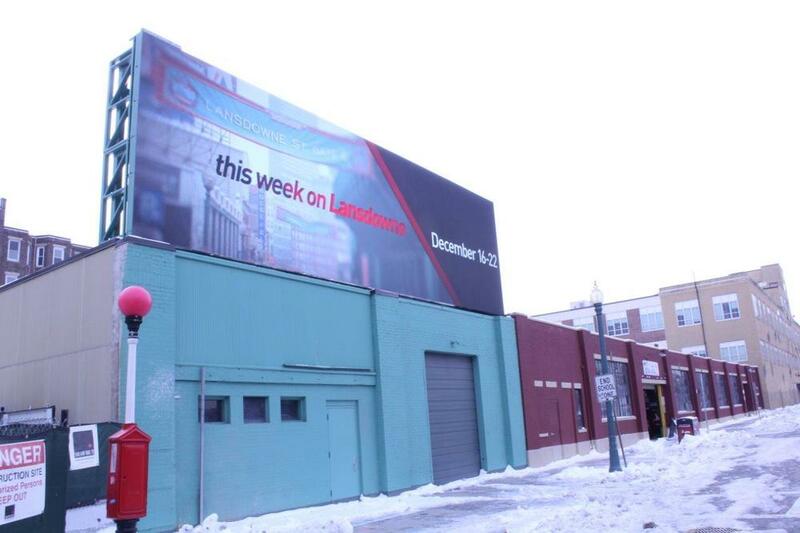 S|N|A's LED video display at the corner of Landsdowne Street and Ipswich Street is a recent addition to the historic area around the Boston Red Sox' Fenway Park. Landsdowne, which is routinely pelted with homeruns that clear the famous Green Monster, dead-ends into the new display. The billboard-like display sits atop the Red Sox-owned Ipswich Parking Garage, just beyond the right-center-field stands of the famous ballpark. Only about 15 feet above ground level, the S|Video LED video display employs a 12 mm pixel pitch. At 340 pixels high by 1170 pixels wide, the screen is capable of sharp imagery and video. Additionally, the display is built surface-mount device (SMD) technology, where the LEDs in each pixel are packaged together, allowing for improved clarity and a wider viewer experience. The LED screen is 13'5" high by 46'1" wide. The sign structure, including S|N|A's LED module enclosures and sub-framing, were custom-painted in the patented "Fenway green." Orange Barrel Media (Columbus, OH), who hired S|N|A to manufacture and supply the LED technology, manages the advertising for the new sign. The display has been utilized by both national brands and local businesses.